Is Donald Trump Nice Enough? : It's All Politics The GOP front-runner is happy to pile on criticisms and jabs at his fellow rivals, but he gets testy if you criticize him. Republican presidential candidate Donald Trump holds a copy of The New York Times in which it was said he wore a toupee, during a rally at the TD Convention Center on Thursday in Greenville, S.C. This presidential campaign, Donald Trump may test the maxim that if you can't say anything nice, you shouldn't say anything at all. Before a boisterous crowd of 1,400 in Greenville, S.C., on Thursday, Trump made no apologies for criticisms he's made about his fellow GOP rivals — even if it's that tone and attitude that have taken a toll on him in at least one area of the polls — an area Trump seems to have a myopic obsession with. "The only thing I did badly on was: Is he a nice person? I was last in terms of niceness," Trump said. In a Thursday Quinnipiac Poll, voters said the first words that came to mind were "arrogant" and "blowhard." I think I'm the nicest of all. I just don't want to be taken advantage of. "I think I'm the nicest of all," he kept insisting. "I just don't want to be taken advantage of!" When he said that people take exception to his tone, he said it's necessary in a world where ISIS is a growing threat. "We need tough tone or we're not going to have a country anymore," Trump said. And as for criticism that he's too unpredictable to be commander in chief, Trump again went on the defensive. "Somebody says Trump doesn't have the temperament," said Trump. "I have perfect temperament!" Trump continued by noting his doctor had even told him he had "the blood pressure of a great athlete." The jabs followed throughout his 50-minute speech, echoing attacks that former Florida Gov. Jeb Bush was too "low energy" and that former Texas Gov. Rick Perry and South Carolina Sen. Lindsey Graham have attacked him at their peril. Instead, he framed the punches he's more than happy to throw as the one injection of enthusiasm into the race. "There's no energy on the other side. 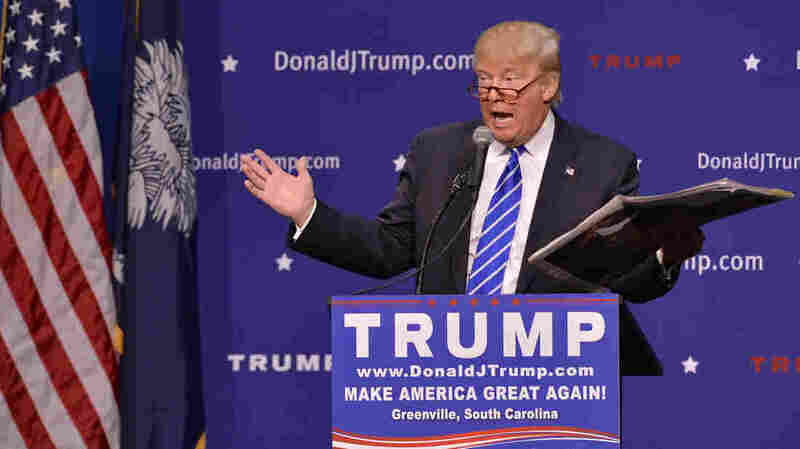 We need tone — we need tough talk," Trump said to cheers. The irony is that even as Trump boasts that he's unafraid to attack other candidates, he's hypersensitive whenever he's the one on the receiving end of criticism. He was still bristling about Univision anchor Jorge Ramos, who's been critical of Trump and questioned him about immigration. Trump's security guards removed Ramos from an earlier speech but later allowed him back in. On Thursday, Trump said Ramos was "ranting and raving like a lunatic." And when a New York Times story suggested he wore a toupee (Trump's hair is one of his touchiest subjects), after holding up the paper and reading the article, the reality TV star called a woman up onstage to pull at his mane and confirm that it was, in fact, real. It's a pattern from Trump on the campaign trail — fire back when fired upon. That's why he's in a long-simmering feud with Fox News and host Megyn Kelly over her pointed questions at the first debate, and why he fired back by giving out Graham's phone number after he dared to criticize him. I love his tone. ... I like to see somebody that speaks their mind, that isn't politically correct. I'm sick of political correctness. Trump's speeches are more entertainment than elocution. He doesn't outline his policy proposals like most candidates on the stump do. He'll talk about his immigration plans ("We're going to build a wall and it's going to be so beautiful!") and how he'll take on Iran and Russia ("I would get along with Putin great!"). Behind his trademarked phrase — "Make America Great Again" — he says to cheers that he wants to make the U.S. more competitive with China and Japan, but there are few specifics so far. To the crowd, that didn't matter. After nearly eight years of President Obama and what they see as an impotent GOP-led Congress, Trump's no-apologies approach is exactly the antidote they're searching for right now. Nearly every line got rousing applause and some got ovations from the crowd. While his rhetoric is reminiscent of the Tea Party insurgency of 2010, the sellout crowd in the Upstate had many business people and country club-type Republicans — the type of voter you'd expect to go to a Bush or Marco Rubio or Scott Walker event. Instead, they lapped up each word Trump gave. That unconventional approach is endearing him to a Republican base that feels ignored, but it's still something that's a problem for Trump in a general election. Trump still has a loyal following he's built in the Republican Party — winning across nearly every platform. But the signs of trouble — and what worries GOP leaders — is that those aren't transferable to a general election. For now though, Trump is hitting all the right notes — nice or not. And the crowd loved it. "I love his tone! It doesn't bother me at all. It makes me very happy," Christie Wilbanks of Simpsonville gushed. "I like to see somebody that speaks their mind, that isn't politically correct. I'm sick of political correctness. He should be able to say what he wants to say. The left has just really got us in a fix because of words, and it's ridiculous." 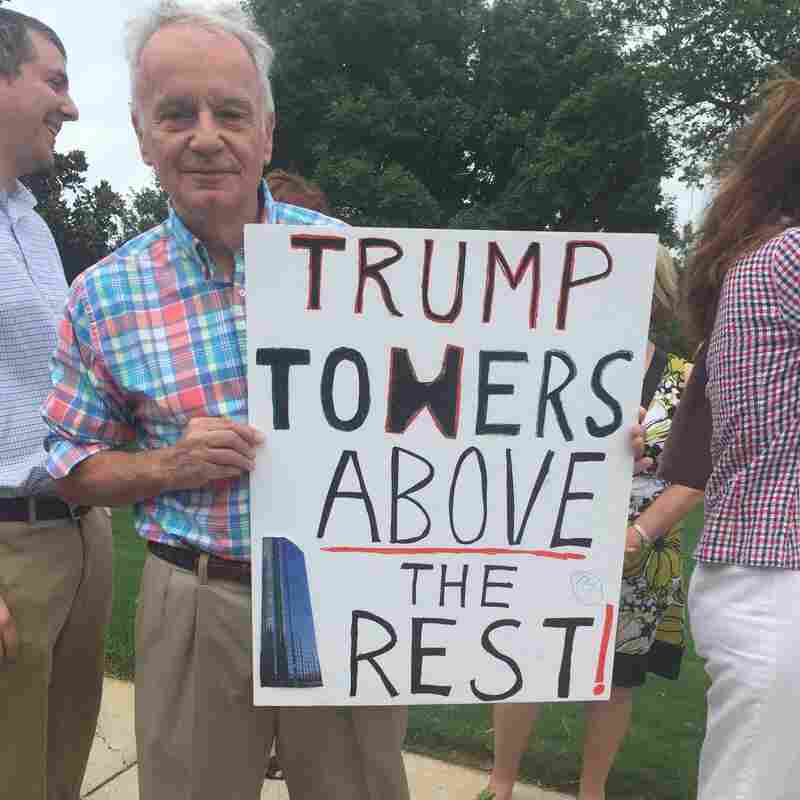 Lou Vales of Greenville, holding a homemade sign that read "Trump Towers Above the Rest," agreed, saying he loved it when Trump would make fun of Bush or Rubio. "I just love that he says things that nobody else says. He made fun of Rubio and Bush for hugging," Vales said. "He's funny as heck. I just love the way he speaks." But even Vales said Trump would probably change if he gets in office. "I think he would actually tone it down if he was elected," he predicted. But for now, Trump shows no signs of changing his tone or the brash attitude that has gotten him where he is. A previous caption incorrectly identified Lou Vales as Tom Vales.